Wireless channels are becoming more and more important, with the future development of wireless ad-hoc networks and the integration of mobile and satellite communications. To this end, algorithmic detection aspects (involved in the physical layer) will become fundamental in the design of a communication system. This book proposes a unified approach to detection for stochastic channels, with particular attention to wireless channels. The core idea is to show that the three main criteria of sequence detection, symbol detection and graph-based detection, can all be described within a general framework. This implies that a detection algorithm based on one criterion can be extended to the other criteria in a systematic manner. Detection Algorithms for Wireless Communications represents a novel contribution with respect to the current literature, with a unique focus on detection algorithms, as such it will prove invaluable to researchers working in academia and industry and in the field of wireless communications, as well as postgraduate students attending advanced courses on mobile communications. Gianluigi Ferrari is an electrical engineer, consultant, and communications educator in Parma, Italy. 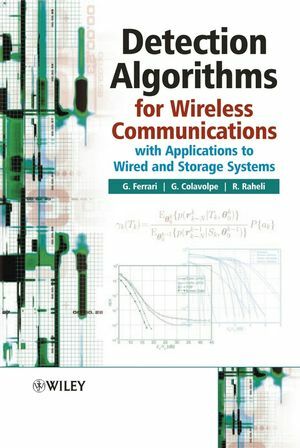 Giulio Colavolpe is the author of Detection Algorithms for Wireless Communications: With Applications to Wired and Storage Systems, published by Wiley. Riccardo Raheli is the author of Detection Algorithms for Wireless Communications: With Applications to Wired and Storage Systems, published by Wiley. 3.10 Complexity Reduction Techniques for VA-based Detection Algorithms. 4.7 An Alternative Approach to Finite-Memory Symbol Detection. 4.8 State Reduction Techniques for Forward-Backward Algorithms. 5. Graph-Based Detection: Algorithms and Applications. 5.2 Factor Graphs and the Sum-Product Algorithm. 5.4 Complexity Reduction for Graph-Based Detection Algorithms. 5.5 Strictly Finite Memory: Inter-Symbol Interference Channels. 5.7 An Alternative Approach to Graph-Based Detection in the Presence of Strong Phase Noise.